LEROS MARINA | Evros S.A.
Leros Marina, Evros S.A., was established in 1989, when the rocky land overlooking the beautiful Lakki harbor was acquired. 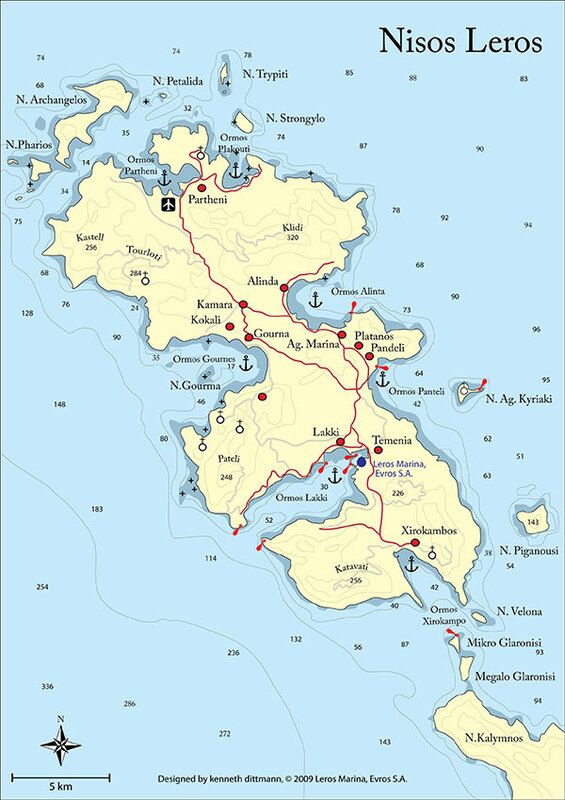 Lakki was used from the Italians as a naval station and aeronautics base for the whole of the Eastern Mediterranean during the Italian possession of the Dodecanese Islands from 1913 to 1943. The area that was selected is found in the north-eastern part and at the head of Lakki bay, GPS: 37o 07’42.30″ N – 26o 51’20.50″ E, at the precise point where the Italians moored their hydroplanes. On this private land, a new yacht harbor and marina has been created. It was the first Marina and Boatyard in the South East Aegean Greek waters. Leros Marina, located at the safest part of Lakki bay, which is completely protected from all the winds, including the ferocious S.E. Sirocco (or “Evros” in Greek), offers the opportunity for memorable moments, in a well known cruising & sailing area, the South Aegean Sea. The private fenced area of 50.000 m2, is divided in a modernly accommodated marina with up to 220 berths, 9 floating pontoons equipped with mooring lines, electricity and water and a fully equipped boatyard with spaces up to 600 boats on the dry-dock. external quay on the south side of the marina, is ready to accommodate any kind of mega yachts up to 50 meters.